The friend can be the girl next door . . . or a faithful dog . . . or a teacher . . . or just plain invisible. But in every life, there's at least one friend who changes your life. 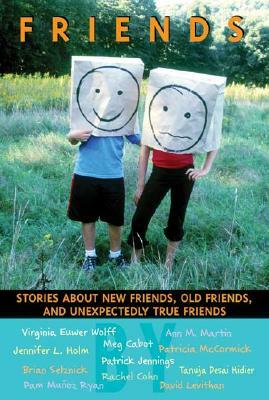 In this collection, writers including Virginia Euwer Wolff, Ann M. Martin, Pam Munoz Ryan, Tanuja Desai Hidier, Walter Dean Myers, Rachel Cohn, Meg Cabot, Jennifer L. Holm, Patty McCormick, David Levithan, and Patrick Jennings present stories about friendship and all of its reverberations. All proceeds go to The Lisa Libraries, which provides small libraries for children in need. Patricia McCormick, a finalist for the National Book Award, is the acclaimed author of CUT, MY BROTHER'S KEEPER, SOLD, and PURPLE HEART. Her debut novel, CUT, was an ALA Quick Pick for YA Readers, an ALA Best Book for Teenagers, and a NYPL Book for the Teen Age. McCormick was named a New York Foundation on the Arts fellow in 2004. She is also the winner of the 2009 German Peace Prize for Youth Literature. She is a graduate of the Columbia University Graduate School of Journalism and lives Manhattan. Tanuja Desai Hidier is American-born and currently based in the UK. She grew up in Wilbraham, Massachusetts and graduated from Brown University. Prior to moving to the UK, she lived in New York City, where she worked by day as a writer/editor for magazines, CD-ROM projects and websites. Her first novel, Born Confused, is a coming-of-age story with an Indian-American protagonist, an aspiring photographer living in New Jersey, and is set in both NJ and New York City, largely in the context of the burgeoning South Asian Club scene. The heart of Born Confused is about learning to bring two cultures together without falling apart, yourself, in the process. The book takes its title from ABCD, or American Born Confused Desi, a slightly derogatory term that the first generation South Asians in the States and elsewhere use to describe these second generation Americans who are supposedly "confused" about their South Asian backgroun. Desi is Hindi for "from my country." This theme of first and second generation India, and of finding your place in America, figures prominently in much of Desai Hidier's other work as well. her Partition-era short story, "The Border," was awarded first prize in the fiction category in the London Writers/Waterstones Competition in October 2001. Also in the fall of 2001, her short story, "Tiger, Tiger," was included in the Big City Lit anthology (New York City) celebrating the last decade of Asian-American writing. Earlier versions of both these works were part of the collection of connected stories for which whe was the 1995 recipient of the James Jones First Novel Fellowship Award. SLJ MARTIN, Ann M. & David Levithan, eds. Friends: Stories about New Friends, Old Friends, and Unexpectedly True Friends. 185p. CIP. Scholastic. 2005. Tr $16.95. ISBN 0-439-72991-2. LC 2004027758.